Forever Manchester is delighted to have been selected as TATTU and Gusto Manchester’s Charity of the Month this December. TATTU’s unique venue takes customers on a visual journey across three separate areas, drawing influence from different styles of body art. Inspired by restaurants found in America’s West Coast, when you enter this venue its clear just why it’s fast becoming on of Manchester’s favourites. We recommend the dim sum! TATTU will also host the next Forever Manchester Women event this coming January, which tickets are still available for. Gusto Manchester, based on Lloyd Street, just off Deansgate in the classic, ornate Elliott House this year raised money by creating the Manchester Martini cocktail, inspired by the flavours of Vimto with a little gin thrown in for good measure. Gusto Manchester is the newest of the Gusto sub-brand within Living Ventures. The restaurant’s decor hints towards the 1920’s and Manchester’s local heritage combined with tall ceilings, a grand island bar, a private dining room and a collection of seating areas. Look out for the exceptional painting on the wall, paying homage to some of our favourite Mancs! Gusto Manchester has now continued with its support by choosing to support Forever Manchester throughout December, one of their busiest months of the year. We are very pleased that both of these restaurants have decided to support Forever Manchester this Christmas. 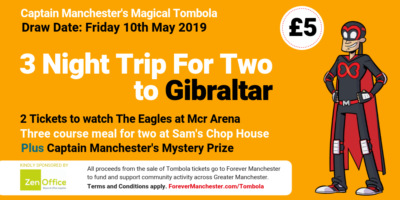 Other restaurants, such as The Alchemist and Australasia have chosen to support Forever Manchester in December in the past, with both raising over £600, thanks to the kindness of their diners. A discretionary charge of £1 will be added to each bill throughout December at both restaurants, with every penny coming to Forever Manchester. So, if you’re in Manchester City Centre this Christmas, be sure to pop into both restaurants. You’ll be guaranteed great food, a great atmosphere and you’ll be doing your bit for charity too!